The Southern Copperhead averages between 22 and 36 inches long when mature. It has a pattern of crossbands on its back, with wide light brown areas alternating with dark brown bands that can have an hourglass shape. 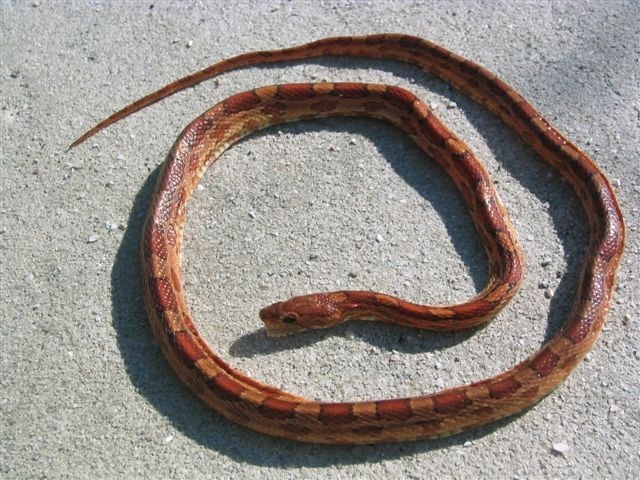 This snake doesn’t even live outside of the Florida panhandle, so it is of no concern on Anna Maria Island. Water Moccasins, also called Cottonmouths and several combinations of those words, have crossbands similar to the copperhead when they are young, but then the bands virtually disappear as the snake becomes very dark in maturity. The eyes of the mature Water Moccasin are not visible from above, and this is a very helpful way to tell the difference between this venomous snake and the harmless water snakes of Florida. It can be frightening when a harmless water snake, basking in the sun on a branch over water tries to jump to the water to flee when a boat approaches, especially if the snake’s timing is off and it lands in the boat. In most cases, the snake is only a harmless water snake. Another way to tell the difference between a moccasin and a harmless water snake is that moccasins have a facial pit between the nostril and the eye, but water snakes do not. Water moccasins are not aggressive but their bite is very dangerous and expert medical attention is advised. There are three kinds of rattlesnake in Florida : the Eastern Diamondback , the Timber Rattlesnake and the Dusky Pigmy Rattlesnake. All three of these are dangerous, but they also serve the important function of keeping rodent populations down. The ideal situation is to avoid killing these snakes and give them plenty of room. Sometimes it’s hard to tell the difference between the Dusky Pigmy Rattlesnake and the Hognose snake, which is harmless. The Hognose flattens its head when threatened, and also may play dead by flipping onto its back. Hognose snakes have no facial pits and no rattles. The Eastern Coral Snake grows to 20 to 30 inches and is ringed with large red and black rings separated by narrower yellow ones. The harmless Scarlet Kingsnake and the Scarlet Snake are often confused with Coral Snakes. A very easy way to tell the difference is to remember that both of the harmless snakes have red on their noses and tails. “If its nose is black, it’s bad for Jack.” The bite of a Coral Snake is dangerous, but statistics show it’s not as dangerous as that of the Diamondback Rattlesnake. For 2 years when visiting AMI, we have saw a snake in the gulf close to shore. We thought at first it was maybe an eel or something else, but no it is a snake. What type of snake is this? Is it poisonous? According to Florida Fish and Wildlife there are no sea snakes in Florida, or any part of Atlantic and Gulf Coasts. It is possible that a land snake was washed into the sea and came ashore at your observation time. In this case it could be a yellow rat snake or a black racer, neither of which are venomous.